1Department of Computer Science and Engineering, Jashore University of Science and Technology, Jashore-7408. To promote sustainable development, the smart city implies a global vision that merges artificial intelligence, big data, decision making, information and communication technology (ICT), and the Internet-of-Things (IOT). These processes above are related for solving real life problems. Food is one of the basic needs of human being. World population is increasing day by day. So it has become important to grow sufficient amount of crops to feed such a huge population. But with the time passing by, plants are affected with various kinds of diseases, which cause great harm to the agricultural plant productions. Beside that many countries economy greatly depends on agricultural productivity and it’s also a need for a country to attain agricultural productivity of basic agricultural product for the people of that particular country. Detection of plant disease through some automatic technique is beneficial as it requires a large amount of work of monitoring in big farm of crops, and at very early stage itself it detects symptoms of diseases means where they appear on plant leaves. In this paper surveys on different disease classification techniques that can be used for plant leaf disease detection. Agriculture is the mother of all cultures. The focus is on enhancing productivity, without considering the ecological impacts that has resulted in environmental degradation. As disease of the plants is inevitable, detecting disease plays a major role in the field of agriculture. Plant pathogens consist of fungi, organism, bacteria, viruses, phytoplasmas, viriods etc. Three components are absolutely necessary for diseases to occur in any plant system and which may infect all types of plant tissues including leaves, shoots, stems, crowns, roots, tuber, fruits, seeds and vascular tissues. Therefore, detection and classification of diseases is an important and urgent task. The necked eye observation of experts is the main approach adopted in practice for detection and identification of plant diseases. However, this requires continuous monitoring of experts which might be prohibitively expensive in large farms. We can analyze the image of disease leaves by using computer image processing technology and extract the features of disease spot according to color, texture and other characteristics from a quantitative point of view. Due to which consulting experts even cost high as well as time consuming too. In such condition the suggested technique proves to be beneficial in monitoring large fields of crops. And automatic detection of diseases by just seeing the symptoms on the plant leaves make it easier as well as cheaper. This also supports machine vision to provide image based automatic process control, inspection, and robot guidance . Plant disease identification by visual way is more laborious task and at the same time less accurate and can be done only in limited areas. Whereas if automatic detection technique is used it will take less efforts, less time and more accurately. In plants, some general diseases are brown and yellow spots, or early and late scorch, and other fungal, viral and bacterial diseases. Image processing is the technique which is used for measuring affected area of disease, and to determine the difference in the color of the affected area . In paper  texture and other characteristics are also used from a quantitative point of view. In paper  color based feature, K-means algorithm along with thresholding values is used for segmentation and identifying fungus. Image classification refers to the task of extracting information classes from a multiband raster image. The resulting raster from image classification can be used to create thematic maps. Depending on the interaction between the analyst and the computer during classification there are two types of classification. i) Supervised and ii) unsupervised. There are currently many different ways of performing image classification, ranging from thresholding methods. This might be color information, boundaries or segment of an image . Machine based approaches for disease detection and classification of agricultural product have become an important part of civilization. Paper  presents a review on existing reported techniques useful in detection of disease. Paper  presents classification and detection techniques that can be used for plant leaf disease classification. Here preprocess is done before feature extraction. RGB images are converted into white and then converted into grey level image to extract the image of vein from each leaf. Then basic Morphological functions are applied on the image. Then the image is converted into binary image. After that if binary pixel value is 0 its converted to corresponding RGB image value. Finally by using pearson correlation and Dominating feature set and Naïve Bayesian classifier disease is detected. In paper [20 there are four steps. Out of them the first one is gathering image from several part of the country for training and testing. Second part is applying Gaussian filter is used to remove all the noise and thresholding is done to get the all green color component. K-means clustering is used for segmentation. All RGB images are converted into HSV for extracting feature. The paper  presents the technique of detecting jute plant disease using image processing. Image is captured and then it is realized to match the size of the image to be stored in the database. Then the image is enhanced in quality and noises are removed. Hue based segmentation is applied on the image with customized thresholding formula. Then the image is converted into HSV from RGB as it helps extracting region of interest. This approach proposed can significantly support detecting stem oriented diseases for jute plant. According to paper  they have proposed for a technique that can be used for detecting paddy plant disease by comparing it with 100 healthy images and 100 sample of disease1 and another 100 sample of disease2. It’s not sufficient enough to detect disease or classify it training data is not linearly separable. In paper  detection of unhealthy plant leaves include some steps are RGB image acquisition. Converting the input image from RGB to HSI format. Masking and removing the green pixels. Segment the components using Ostu’s method. Computing the texture features using color-co-occurrence methodology and finally classifying the disease using Genetic Algorithm. Paper  includes tomato disease detection using computer vision. A gray scale image is turned into binary image depending on threshold value. The threshold algorithm is used for image segmentation. The threshold values are given color indices like red, green, blue. But the thresholding is not a reliable method as this technique only distinguishes red tomatoes from other colors. It becomes difficult to distinguish ripe and unripe tomatoes. For this K-means clustering algorithm is used to overcome the drawbacks. K-means create a particular number of non-hierarchical clusters. This method is numerical, unsupervised, non-deterministic and iterative. Then separating the infected parts from the leaf the RGB image was converted into YcbCr to enhance the feature of the image. The final step is the calculation of the percentage of infection and distinguishing the ripe and unripe tomatoes. The methodology for cucumber disease detection is presented in paper . The methodology includes image acquisition, image preprocessing, feature extraction with Gray level co-occurrence matrix (GLCM) and finally classified with two types: Unsupervised classification and supervised classification. Paddy plant is an important plant in continental region. In paper  RGB images are converted into gray scale image using color conversion. Various enhancement techniques like histogram equalization and contrast adjustment are used for image quality enhancement. Different types of classification features like SVM, ANN, FUZZY classification are used here. Feature extract6ion uses different types of feature values like texture feature, structure feature and geometric feature. By using ANN and FUZZY classification, it can identify the disease of the paddy plant. In paper  popular methods have been utilizes machine learning, image processing and classification based approaches to identify and detect the disease of agricultural product. In paper  image processing technique are used to detect the citrus leaf disease. This system includes: Image preprocessing, segmentation of the leaf using K-means clustering to determine the diseased areas, feature extraction and classification of disease. Uses Gray-Level Co-Occurrence matrix (GLCM) for feature extraction and classification is done using support vector machine (SVM). Here is a tabular list of names of reviewed paper, with their methodology and future works is presented below in table 1. Table 1: List of reviewed papers with Name, Used methods and Future work. Detection and Classification technique Of Yellow Vein Mosaic Virus Disease in Okra Leaf Images Using Naïve Bayesian Classifier. k-means clustering, Basic Morphological functions, Naïve Bayesian classifier, Color Co-Occurrence method. K-means clustering algorithm with SVM, Color co-occurrence method. Developing combinations of more algorithms by using fusion classification technique so as to improve the detection the detection rate of the classification process. Color co-occurrence methods, Multi SVM classifier. It identifies the burning and blast disease of paddy. In further enhancement this method can be used to find all kind of diseases in various leaves. This may help the farmers in identification of the disease in the leaf in feasible and accurate way, in short time span. Detection Of Unhealthy Plant Leaves Using Image Processing and Genetic Algorithm with Arduino. Genetic algorithm, Arduino, Masking the green pixel and color co-occurrence method. Maturity and disease detection in tomato using computer vision. Cucumber disease detection using artificial neural network. Classification accuracy can be increased by using additional texture features. Detection and measurement of paddy leaf disease symptoms using image processing. ANN, FUZZY classification, SVM, K-means algorithm, color co-occurrence method. It evaluates the techniques in image processing, detecting diagnosing of crop leaf disease. Recent Machine Learning Based Approaches for Disease Detection and Classification of Agricultural products. K-means, GLCM, ANN, SURF, CCM, SVM. According to this paper there is a need of system in agriculture science can combinely detects the disease on all kinds of plants, Fruits and Vegetables. Detection of leaf disease and classification using digital image processing. Classifying different plant disease and improve the classification accuracy. Here is a tabular list presented below in table 2 according to the accuracy value and methods that has been used to achieve that accuracy level. 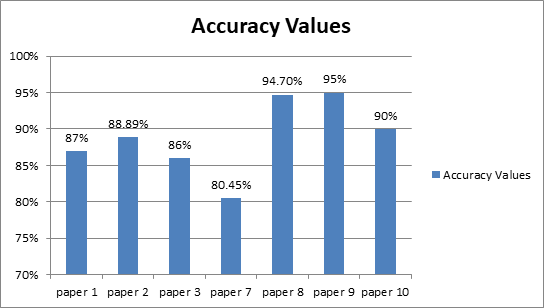 Also the figure 1 represents accuracy values with respect to paper number in this literature review work. Table 2: List of reviewed papers with accuracy values and used methods. Figure 1: Graph Representation of accuracy values of reviewed paper. This paper gives the survey on different diseases classification techniques that can be used for plant leaf disease detection and an algorithm for image segmentation technique used for automatic detection as well as classification of plant leaf diseases has been described later. Jute, Grape, Paddy, okra are some of those species on which the algorithms and methods were tested. Therefore, related diseases for these plants were taken for identification. With very less computational efforts the optimum results were obtained which also shows the efficiency of algorithm in recognition and classification of the leaf diseases. Another advantage of using these methods is that the plant diseases can be identified at early stage or the initial stage. To improve recognition rate in classification process Artificial Neural Network, Bayes Classifier, Fuzzy Logic and hybrid algorithms can also be used. Dhiman Mondal, Dipak Kumar Kole, Aruna Chakraborty, D. Dutta Majumder" Detection and Classification Technique of Yellow Vein Mosaic Virus Disease in Okra Leaf Imagesusing Leaf Vein Extraction and Naive Bayesian Classifier., 2015, International Conference on Soft Computing Techniques and Implementations- (ICSCTI) Department of ECE, FET, MRIU, Faridabad, India, Oct 8-10, 2015. Pranjali B. Padol, Prof. AnjilA.Yadav, "SVM Classifier Based Grape Leaf Disease Detection" 2016 Conference on Advances in Signal Processing(CAPS) Cummins college of Engineering for Women, Pune. June 9-11, 2016. Ms.Poojapawer ,Dr.varshaTukar, prof.parvinpatil "Cucumber Disease detection using artificial neural network"
Mukesh Kumar Tripathi, Dr.Dhananjay, D.Maktedar'' Recent Machine Learning Based Approaches for Disease Detection and Classification of Agricultural Products'' International Conference on Electrical, Electronics and Optimization Techniques (ICEEOT)-2016.